"Wow, that’s one big fish!" 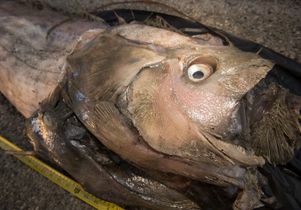 That was the reaction of everyone at UCLA’s Translational Research Imaging Center when a monster fish story became reality in the form of a rare 14-foot, 250-pound oarfish, whose snake-like carcass washed ashore in Oceanside last month and ended up in nine pieces at the state-of-the-art imaging facility on campus. 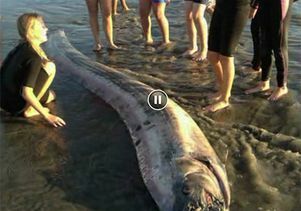 Beachgoers surround a dead oarfish that washed ashore in Oceanside last month. Eventually, it was brought to UCLA radiologists in nine pieces. See the KSWB-TV San Diego video below. On Nov. 21, scientists from UCLA and California State University, Fullerton teamed up to study the big oarfish, the second found DOA in Southern California waters last month after the first one surfaced off Catalina Island. 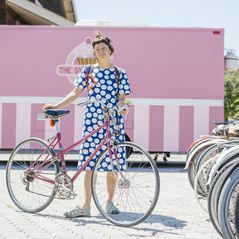 A camera crew captured the process at UCLA for an upcoming segment on the Discovery Channel’s Daily Planet — the latest flurry of media interest since the giant specimen became hot news around the nation. Misty Paig-Tran, 32, a CSUF ichthyologist (that’s a fish scholar to you and me), had approached Dr. Dieter Enzmann, UCLA chairman of radiology, with an irresistible offer. Would his department’s specialized center perform a computerized tomography (CT) scan on the oarfish? Enzmann enthusiastically agreed. 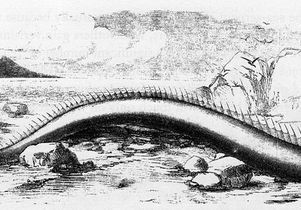 After all, the oarfish, a mysterious deep-sea species that most likely spawned the sea-serpent legend of yore, was first described in 1772. But it’s been poorly studied by researchers and rarely glimpsed by sea divers. Living as deep as 3,300 feet below the ocean’s surface, the monstrous fish can grow up to 30 feet long and weigh as much as 600 pounds. This particular silvery, red-finned specimen offered an unexpected bonus to scientists. Its six-foot-long ovaries were overflowing with millions of eggs, which Paig-Tran’s team plans to count and analyze. 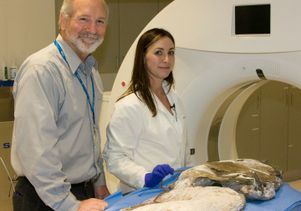 Radiologist Michael McNitt-Gray and ichthyologist Misty Paig-Tran position the oarfish for a CT scan at UCLA's Translational Research Imaging Center. Photo by David T. Nelson/UCLA Radiology. With expertise in biomechanics, Paig-Tran is teasing out how the shape of the oarfish affects its function. Her goal? To trace the evolution of the fish’s Jell-O-like skeleton and unravel how the elusive oarfish can swim upright, with its head aloft and its tail hanging vertically. "The oarfish hangs motionless in the water for much of the day, except for its continuously beating dorsal fin, which is bidirectional," explained Paig-Tran. In its CT scans, she is looking for clues "that explain why the fish moves its fin this way and how its soft skeleton contributes to its swimming performance." 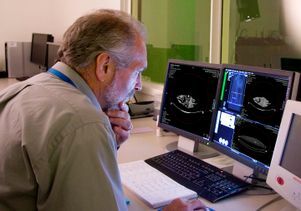 It’s not your typical task at the UCLA Translational Research Imaging Center, equipped with the most sophisticated imaging technologies available. Usually, UCLA scientists at the center are developing and testing new medical devices and drugs prior to their use in human clinical trials. The lab also trains clinicians in new FDA-approved therapies to benefit patients in the fields of cardiology, neurology neurosurgery, radiology and urology. In the case of the oarfish, the tricky part for radiologists came in prepping the fish and then transferring the data, a task that took more than 12 hours. As a fishy odor perfumed the air, Michael McNitt-Gray, a professor of radiology at the David Geffen School of Medicine at UCLA, painstakingly positioned the fish on the center’s high-resolution CT scanner. The head of the oarfish. Photo courtesy of California State University, Fullerton. Even though it was chopped into nine pieces and frozen for transport, the oarfish was so long that McNitt-Gray could only scan three pieces at a time. The actual scan required only a few minutes. 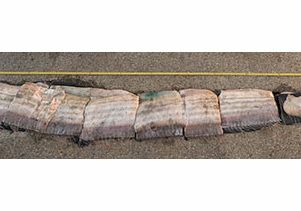 "I was expecting something unusual, but nothing prepared me for the oarfish’s size and unique structure," said McNitt-Gray, a medical physicist who advises numerous national and state task forces on clinical CT techniques. 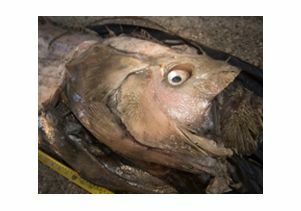 "Dr. Paig-Tran described the fish’s anatomy as it materialized on the monitor before my eyes. That’s what I find so interesting about my work— experts are making discoveries as we scan." Paig-Tran will use the scans to create a three-dimensional model of the fish and then spend several months dissecting the fish to remove the bone for further study. The findings she gleaned from UCLA’s scans will be published in an upcoming paper, but until then, the oarfish’s secrets remain buried at sea. A news segment from KSWB-TV San Diego about the oarfish.